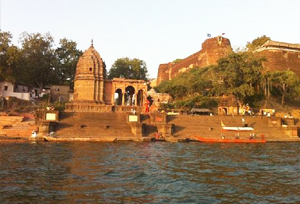 A temple town on the bank of Narmada River, Maheshwar is situated in Khargone district of Madhya Pradesh. It is believed that Lord Shiva is worshiped where the Narmada flows because he is the only idol of inner peace to calm her. It has mythological and historical importance as it is believed that King Sahasrarjun who was a husband of 500 wives had stopped Narmada River with his 1000 arms and made a play area for his wives. During this period, the Shivalinga was made by Ravana on the riverside. When he released the river water, the Shivlinga was washed away and that ensued in war between both of them. But when king got the victory, he kept ten lamps on the heads of Ravana and one on his hand. Now, you can see 11 lamps in the Sahasrarjun Temple to keep the event lively. 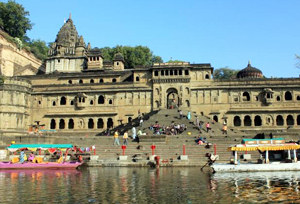 Besides, Maheshwar is known for its spiritual importance, which is mentioned as Mahishmati in the famous Hindu epics Ramayana and Mahabharata. In addition to all these, Maheshwar is popular for making unique and delicate cotton and silk blend handloom saris. It is recognized for its huge production of Maheshwari sarees and this makes this popular tourist destination a perfect paradise for shopaholics. The scenic beauty of the town and Narmada River is captured in loads of Bollywood and Tamil Movies. There are plenty of accommodation options ranging from budget to mid-range hotels. All the hotels are well equipped with modern facilities and amenities. The rooms look across breathtaking views of the surrounding areas and give reasons to visit over and over. The city is famous for delicate cotton and silk textiles. There are plenty of handloom shops that offer woven and designed silk sarees which are known as Maheswari Sarees. If you're here for shopping then do not miss to buy wonderful pieces of textile art. By Air: The nearest airport to reach Maheshwar is the Indore Airport, which is located at the distance of 91 km. By Train: Marwaha Railway Station (Approx 39 Km) is the nearest railway junction to reach the destination. By Road: Maheshwar is well connected by road to various cities of Madhya Pradesh. There are various private and state government buses that connect to major cities of the state like Nasik (328km), Mumbai (220km), Pune (113km), and Kolhapur (179km).